After having been captured in a Crimea during a failed attempt to flee overseas, Leo returns in Petersburg for Kira. Lamberto Picasso ... Il capo della G.P.U. 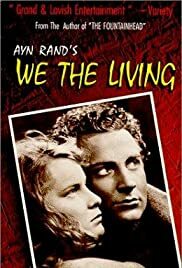 Goffredo Alessandrini's unauthorized 1942 version of Ayn Rand's novel "We the Living" appeared in Fascist Italy in two separate parts: NOI VIVI and ADDIO, KIRA. They are essentially one film. It was the grim story of post-revolutionary Russia, the forced collectivization of the economy and the brutal suppression of human rights, all told from the viewpoint of one woman, Kira. Ayn Rand's novel was autobiographical and was essentially a diatribe against the loss of individuality in totalitarian societies. The film attracted a sizable audience in Italy. The Fascist government saw the film(s) as a condemnation of Soviet misery but when it became aware that the movie(s) implied a condemnation of all totalitarian states, left and right, it withdrew them from distribution. They were not seen again and were thought lost until the early 1960s when Ayn Rand's attorneys located prints in Rome. Ayn Rand liked the movie(s) a great deal, while having reservations about certain liberties that had been taken with dialog and situations. She died in 1982 and did not live to see the re-issue of the film, which was brought about under the auspices of the Ayn Rand estate. The original two-part 4-hour version was edited down to a 170-minute one-film version. One major speech (of Fosco Giachetti) was redubbed to assert Randian philosophy, and the ending (with the death of Kira in the snow as she is shot trying to escape from Russian) was eliminated, rendering the film more optimistic. We are glad that the film was made available in some form after having been lost for decades. After all, how many films from Fascist Italy get picked up for commercial distribution in America these days? But we also regret that Alessandrini's complete artistic achievement was truncated and tampered with. Wasn't creative integrity the theme of Rand's novel "The Fountainhead"? Having had the good fortune of seeing the uncut integral two films on video in Italy, I can vouch for them as being more satisfying, less disjointed in that format. Let's be clear. This new version is NOT a "restoration" as some are calling it. It is, rather, an "adaptation." We are ambivalent about it but pleased to have it. And the 35mm print material is first rate. As much as anything else, WE THE LIVING is a whopping good love story, of "Camille"-like intensity and "Anna Karenina"-like grandeur. The stunning Alida Valli as Kira and Rossano Brazzi as her wastrel lover Leo, devour the screen in their scenes together. Fosco Giachetti as Andrei, head of the secret police and willing to sacrifice honor and ideals for Kira, is poignant and unforgettable. As is this film, or as are these films.